Japanese Imari Porcelain And The Ceramics Collector – What Do You Look For? Brilliant colors, clear designs and pleasing forms. Avoid muddy and poorly-painted pieces. Do not buy restored or damaged wares. Diversify – Choose different designs: floral, animals, birds, tapestry, and people. Look for different background colors. Chocolate-brown is a rare and unusual color of Japanese Imari porcelain to collect. Buy a piece of Fukagawa, there is no finer Japanese Imari porcelain. Unusual Shapes such as Birds, fish, boat and fan designs are fun. Try to find a Black Ship piece, commemorating the Dutch traders and their sailing vessels. 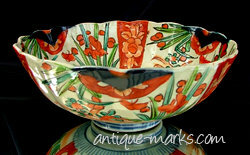 These are very rare forms of Imari porcelain and can be expensive, so remember to invest for the long term. Japanese Imari Porcelain was first made in the late Momoyama/Early Edo period (turn of the 17th century). It is generally believed that the naturalised Korean potter Ri Sampei (1579-1655), who had been brought to Japan in 1598, discovered clay for porcelain production at Izumiyama near Arita. And that he fired the first plain white and the first underglaze cobalt blue porcelains in Japan. Sampei established a kiln at Tengudani, and from then on Arita developed until the area grew to rival Ching-te Chen in China as a production center of fine porcelain. Japanese Imari Porcelain is a very popular collectible and appeals to all sorts of people. Some prefer the Derby Imari porcelains but to truly appreciate Imari you just have to add Japanese Imari porcelain pieces to your Oriental porcelain collection.